Mount Shasta reigns over Siskiyou County, a commanding presence even when cloaked in clouds. The snow on its flanks percolates into a vast underground aquifer of volcanic tunnels and bubbling springs. Steeped in legend and celebrated for its purity, Shasta water is almost as mysterious as its namesake California mountain. Little is known about how much is actually stored there or how it moves through the subsurface fractures. Locals and reverent pilgrims might have been the only ones to appreciate this water if it weren’t for the private companies now descending on the small towns at the mountain’s base. Ten different proposals have sought to bottle and send water to markets as far away as Japan. Four have been approved. Nestlé, Crystal Geyser and startups like McCloud Artesian Spring Water, attracted to the region by its combination of water availability and economic decline, have been welcomed by county officials. This cradle of the state of Jefferson is generally resistant to regulations, and it has been particularly accommodating to bottled water. With the collapse of logging and mining before that, “other industries are not exactly beating a path to us,” says Siskiyou County Supervisor Ed Valenzuela. But some residents of the towns scattered across this Northern California county are questioning the effects of commercial pumping on the aquifer and demanding more scientific information. Even as bottled water sales grow — from 9.2 billion gallons nationally in 2011 to 12.8 billion gallons in 2016 — numerous Western communities are resisting the companies determined to extract their water. Some, like the Siskiyou community of Dunsmuir, welcome the jobs, while others, such as McCloud, are fighting the attempts of international corporations to privatize their local water sources. “Water is a resource. It’s our resource. It’s why we are here,” says Bob Hall, former mayor of Weed. Mount Shasta, seen from Highway 89 near McCloud, California. The latest proposal to bottle Shasta water is aimed at McCloud, a faded logging town whose broad streets offer glimpses of the peak’s glaciered slopes. Dominating downtown is the century-old McCloud Hotel, built for lumber workers in an era when the sawmill provided the town’s electricity and steam heat. Today, the three-story hotel caters to skiers, hikers and anglers lured by one of the West’s most famous trout streams. Across Main Street from the hotel is Mountain Community Thrift Center, an artfully arranged hole-in-the-wall with ice skates and vintage clothing for sale at bargain prices. On a cold January afternoon, Angelina Cook presides from behind the ironing board that serves as a sales counter. Lean and athletic, with weathered laugh lines around blue-green eyes, Cook has a gray-flecked braid that swings across her back. A McCloud resident and watershed advocate with the Mount Shasta Bioregional Ecology Center, Cook, 42, has spent 13 years working to protect the area from threats to its communities and ecosystems. “And here we go again,” she says with a weary smile. When Nestlé Waters North America came to McCloud in 2003, the community of 1,100 residents had just days to review the corporation’s proposal to pump 1,250 gallons a minute of spring water into a million-square-foot bottling facility. The McCloud Community Services District, the only local government, had entered into a closed-door agreement for a 100-year contract that placed no limits on the amount of surface and groundwater Nestlé could use. Locals feared that Nestlé would siphon off the surface water that supplies their homes and gardens — an increasingly precious asset threatened by climate change. A grassroots coalition challenged the contract in Siskiyou County Superior Court, which ruled it null and void. It took five years of pressure before Nestlé scrapped its lobbying and legal efforts. Under its agreement with the services district, the company would pay $500,000 annually for spring water. The project would help fund the fire department, ambulance and other services, and provide around 30 well-paying jobs, says Kimberly Paul, the district general manager. Critics object to what they call sweetheart exemptions for bottling companies, citing a dearth of information about the water table and a lack of scientific studies on groundwater pumping’s impacts. Exporting groundwater out of the county requires a permit, but the ordinance exempts bottling companies, and it doesn’t apply to spring water. State laws requiring local regulation of groundwater do not apply because most of Siskiyou County is not considered a groundwater basin. Cook coordinated a 2016 ballot measure that would have required a permit for all groundwater exports. Nearly 56 percent of the voters rejected it, however. Fears that bottling companies will drain community water are unfounded, says Jill Culora, a spokeswoman for International Bottled Water Association. Bottled water comprises just 0.011 percent of all water and 0.02 percent of all groundwater used in the United States. 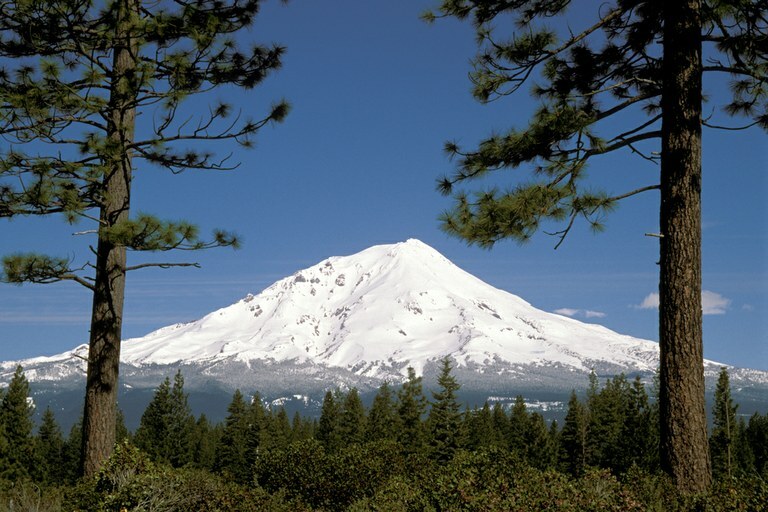 In an aquifer as convoluted as Shasta’s, it’s not easy to determine the effects of pumping groundwater or diverting springs for bottled water, says Gordon Grant, a hydrologist with the U.S. Forest Service’s Pacific Northwest Research Station. With most of the 80 inches of annual precipitation seeping underground, some estimates suggest as much as 40 million acre-feet may be stored in the complex volcanic fissures — more than California’s top 100 reservoirs combined. The residents of Mount Shasta City, 12 miles northwest of McCloud, want to learn more about their aquifer. They hope to bring some scientific scrutiny to Crystal Geyser’s proposal to reopen a Coca-Cola plant idled since 2010. Neighbors complained the previous operation depleted their household wells. But in 2013, Siskiyou supervisors authorized the new project with no public hearings and no caps on pumping groundwater, which pays nothing to the community. A citizens’ group demanded a review of the impacts and eventually won an environmental report certified in December. It was not the victory they hoped for, says Bruce Hillman, president of We Advocate Through Environmental Review. The report contains numerous factual errors, relies on “old scientific data,” and provides no way for the county to enforce limits on pumping if the operation affects neighboring wells, he says. Crystal Geyser officials declined to comment. County officials say they’ll be monitoring the company to ensure it does not harm the environment. “No one’s going to get a free ride,” says County Supervisor Valenzuela. Hillman and his group are not convinced. With the Winnemem Wintu Tribe, they have asked a Siskiyou County judge to set aside the county’s environmental report. In Weed, a gritty working-class town on the northwest flanks of Mount Shasta, former Mayor Hall has been watching the water table for decades. “We know it’s not what it was 40 years ago,” he says. Here, the expansion of a Crystal Geyser plant in operation since 1996 is eclipsed by a court battle over who owns the water in question. Around the West, other rural communities are also contesting bottling proposals. Nestlé’s decade-old effort to open a plant in Cascade Locks, on the Columbia River in Oregon, failed in October, when Oregon Gov. Kate Brown, D, halted a critical exchange of water rights. In Southern California, Nestlé is disputing a state report that says it lacks proper rights to about three-quarters of the water it withdraws from the San Bernardino National Forest. Siskiyou County citizens are pressing for information about their water before more international corporations move in. The Mount Shasta group is involved in court-mandated settlement discussions with the county over the Crystal Geyser environmental review, while Weed’s citizens expect a ruling later this year on water ownership. In McCloud, a draft environmental review for the proposed bottling operation should be available in 2019. From her perch behind the ironing board at the McCloud thrift store, Cook seems resigned to a long struggle over corporate prospecting for Shasta water. She shakes her head with a wry smile. “It’s nothing less than a water industry siege on Mount Shasta,” she says.